Home Microsoft Understanding Windows Intune in a Scenario. Understanding Windows Intune in a Scenario. Lets assume that you are managing director of a company You rely on employee pc's so you need them to be operated at peak performance, highly alerted and keep secure regardless so would have they are in use in the main office, at branch office at home or on the road. This is not so easy when you consider that every company pc is configure differently and it is not always within reach. your IT manager doesn't have any tool to centrally manage desktops theoretically, it means he would have to visit every single workstation to perform updates, install new service packs, or solve other problems such as virus attacks, this could take allot of time and be quite unproductive. not only that but in the future, you want to increase data security, well at the same time guaranteeing your employees mobility, but how could you achieve all of this without expensive infrastractural investments? quit simply with Windows Intune. 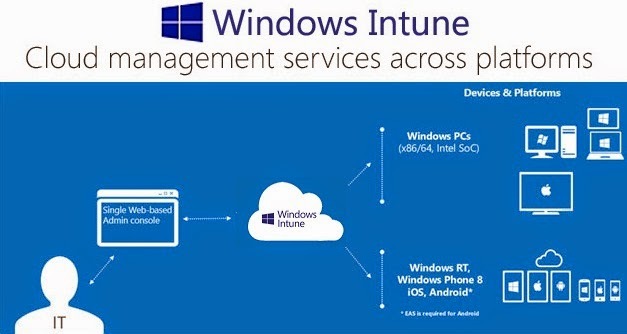 Windows Intune combines the advantages of cloud computing for managing and securing PCs with the upgrade rights to the current windows Enterprise Operating System, and all of this in one subscription without costly infrastructural investments. All it requires is an appropriate basic operating system license, which is eligible for an upgrade such as windows XP Professional. in the future, your IT manager can use the Windows Intune cloud service to manage all company PCs centrally through a single web based sonsole. He can easily track hardware and software inventory, and he can centrally create and manage policies for example for firewall or update settings directly from his desk, regardless of the end users location. Windows Intune also provides central protection against Malware, thanks to Microsoft Malware Protection Engine. If for one or several PCs there is a risk due to viruses or outstanding updates your IT manager will automatically be alerted by windows Intune. He can then pro-actively prevent problems before they even arise, or he can use remote support to offer immediate help. He also has the option to approches the Microsoft Desktop Optimization Pack a set of six on-site advanced desktop management tools, and with upgrade rights to the current Microsoft windows Enterprise Operating System. Users has been effected from access to functions such as bit locker drive encryption to protect confidential data, otherwise both would only be possible if they acquired a software assurance licenses. and best of all, all advantages of winodws Intune can not only be used directly on the main office but also in branch offices, at home or on the road, all you need is an internet connection, the cloud solution does create unlimited mobility for everyone. your IT manager might be enthusiastic with Windows Intune, he has found a solution that can be implemented immediately simplifying his daily work in managing all PCs and containing the best functions of Windows 8. Thanks to the inexpensive affordable monthly cost, it is a solution that also saves him money in the process and all without costly infrastructural investmen. it is no surprise that you are also happy with the solution.